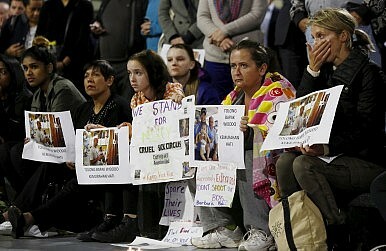 Supporters of Australian convicted drug traffickers, Andrew Chan and Myuran Sukumaran, participate in a vigil in Sydney, Australia, April 28, 2015. Despite initial warnings of “consequences,” Australia and Indonesia have been quietly improving their ties. The first anniversary of the executions of convicted “Bali Nine” drug traffickers, Andrew Chan and Myuran Sukumaran, recently (and quietly) passed. The Australians were executed following a decade long legal battle and protracted diplomatic petitions from the Australian government to pardon the duo from facing an Indonesian firing squad. The limited media coverage of the anniversary — April 29 — was noticeable, particularly given the saturation of reporting that surrounded the story this time last year. From the emotive pleas of family and loved ones, to footage of candlelit vigils across Australia, never had a story in the country’s recent history shaken the nation’s conscience like the pair’s tale of sin and redemption. During the helter-skelter reporting in the lead up and wake of the executions, there was much speculation about the effects the incident would have on future Indonesia–Australia relations. Australian Foreign Minister Julie Bishop herself commented that the executions would “have consequences.” A year later, it’s time to examine the effects the incident had—if any—on Australia’s historically tempestuous relationship with Indonesia. Beyond the recalling of Australia’s ambassador to Indonesia in the aftermath of the executions, it can be argued that any longer-term political effects of the incident have been negligible. Australian Prime Minister Malcolm Turnbull’s ascendance to power in September 2015 demonstrably helped Australia’s relationship with Indonesia. Numerous commentators, like the University of Melbourne’s Dr. David McRae, have questioned the fondness of the relationship between former Prime Minister Tony Abbott and incumbent Indonesian president, Joko Widodo (known affectionately as ‘Jokowi’); Turnbull’s approach is a stark contrast. Indeed, Jokowi’s decision to remove his jacket and tie during a walk through the steamy Tanah Abong textile marketplace in Jakarta, and Turnbull’s recent reference to the president and his wife using the respectful titles of bapak and ibu, further suggest both leaders’ commitment to a more respectful, open relationship. The rebuilding of relations between the countries’ top political elites doesn’t seem to be restricted to Turnbull and Jokowi either. Foreign Minister Julie Bishop has spoken about the closeness of her relationship with her Indonesian counterpart, Retno Marsudi, whom she regularly communicates with via text message. That many current members of Jokowi’s cabinet are Australian-educated offers further opportunities for collaboration between both countries’ governments. However, this cultural literacy cannot be one-sided. It has been argued that more attempts need to be made by top Australian politicians to connect with Indonesia politically, culturally, and linguistically. This lack of engagement was particularly apparent at a recent talk in Canberra by former Indonesian president and great Australia advocate, Susilo Bambang Yudhoyono, which was barely attended by Australia’s political and bureaucratic elite. Allan Behm questions whether there would have been greater attendance if the oration had been delivered by former president of the United States Bill Clinton. Regular and robust communication at the highest levels, already seen in frequent ministerial meetings and cooperation in multilateral fora like the Bali Process, will also help toughen the relationship so that it may resist future shocks of the kind seen this time last year. Continuing such robust cooperation on a range of mutual issues—from stemming people smuggling to combating counter-terrorism—offers further opportunities for bilateral collaboration and trust-building, while addressing some of the most pressing contemporary challenges facing the region. In particular, the bombings in Jakarta earlier this year were a sobering reminder of the threat of terrorism on the archipelago, and the need for Australia to continue to assist Indonesia with its counter-terrorism capabilities, despite a reported scaling back of funding. While Turnbull and Jokowi have made good attempts to rebuild the troubled relationship, the challenge for both leaders is to resist complacency at the behest of domestic priorities. For Jokowi, this may be his preoccupation with passing ambitious reform packages in an opposition-controlled legislature, or his attempts to reverse his waning popularity. For better or worse, the history of the relationship between Indonesia and Australia has been described as a rollercoaster, typified by constant peaks and troughs. While it seems that the relationship is enjoying smooth sailing for the time being, there are likely to be issues in the future that ignite old tensions. Perhaps the most obvious political flashpoint is Indonesia’s insistence on the death penalty. While it has been said that Jakarta is considering a moratorium on executions so as to not compromise Indonesia’s important trading relationships, the winds of change may prove to be little more than hot air following reports that Indonesia will be resuming executions in the coming months. Other sensitive bilateral issues that Indonesia has raised concern over in recent history include those relating to immigration, such as the limits of Australia’s naval reach as part of Operation Sovereign Borders, and sharing responsibility for the accommodation of asylum seekers within the region. While there is a certain durability to the relationship as it waits out the troughs, there is a need for robust and culturally-sensitive thought-leadership on strategies that will help both countries navigate these and other divisive issues in the future. It has been said that that Turnbull’s successful visit to Jakarta led to the resurrection of talks for the Indonesia-Australia Comprehensive Economic Partnership Agreement (IACEPA). While negotiations for IACEPA were initiated four years ago, talks have been dogged by delays resulting from other diplomatic and political difficulties affecting the relationship. Furthermore, as former Australian Trade Minister Andrew Robb admitted, in recent times Canberra has been more preoccupied with trade with Northeast Asia. This is reflected in the fact that, despite Indonesia being Australia’s nearest neighbor, Indonesia is only Australia’s twelfth largest trading partner. Putting the past to the side, political goodwill for the negotiation of a comprehensive free trade agreement appears strong on both ides of the Timor Sea. This is due to the growing realization of the complementarities of both nations’ economies, and particularly, Indonesia’s potential as an export market as it moves to become the world’s fifth largest economy by 2030. Jokowi has spoken about the need for the Indonesian economy to diversify its export activity and for its economy to become less reliant on the export of raw materials like coal, iron, and palm oil, instead moving toward the production and export of lifestyle products and services. Similarly, the president has shown a recent commitment to cutting regulatory and licensing red tape, and providing greater assistance to foreign investors. Given the strong complementarities between both economies, like Australian consumers’ appetite for lifestyle products and the value of services to the Australian economy, there are hopes that a trade deal can be concluded in the next 12 to 18 months. A strong commitment to finalizing a trade deal can also be found in Canberra. The current and former Coalition government’s commitment to economic diplomacy — that is, creating prosperity for the Australian economy — has led to the conclusion of three critical FTAs with China, Japan, and Korea in the past three years, the signing of the Trans-Pacific Partnership, and progress on other key bilateral and multilateral trade deals. One way to ensure that commitment to the negotiations lasts is through the possible adoption of an “early harvest” approach. This involves trying out trade liberalization and market access measures in special economic zones in parts of Indonesia, particularly in the cattle trade, financial services, and skills development sectors, to test the impact of the measures on the economy there as well as the public’s reaction. Indonesian and Australian industry are also increasingly having buy-in to the negotiation process to ensure that any deal properly considers the needs of cross-border trading companies and investors. Indeed, the Indonesia-Australia Business Partnership Group (IA-BPG) which just met in Perth, collectively represents the concerns of peak Australian companies doing business in Indonesia and advocates those companies’ concerns and recommendations for facilitating easier exchanges as part of the IACEPA’s negotiation. In the future, more needs to be done to silo the work of Canberra and Jakarta’s trade negotiators from the throes of other political and diplomatic issues affecting the relationship. As is increasingly the case, one strategy may be the greater involvement of industry, academia, and civil society as part of a so-called strategy of “track two diplomacy.” This will allow for greater integration of non-government and business interests, which will undoubtedly foster familiarity and longevity in the long-term bilateral relationship. While the executions of Chan and Sukumuran polarized the Australian community, it seems that any ill-feeling among Australians toward their neighbor was short-lived. Though more can be done to build commonalities between the Indonesian and Australian people, there have been recent efforts at both the macro government and micro people-to-people levels to foster greater understanding of the other. First, and perhaps most importantly, Jokowi is playing a positive role in his commitment to tolerant and inclusive Islam, which sits comfortably with mainstream Australia’s distaste for religious extremism and its prized tenet of multiculturalism. Given both countries’ historical brushes with terrorism, whether through the recent attacks in Jakarta or the 2002 Bali Bombings, the commitment of one of the world’s largest Muslim countries to moderation, de-radicalization and counter-terrorism will resonate well beyond Indonesia. In Indonesia, Australian Overseas Development Assistance (ODA) continues to help fund worthwhile projects that transform people’s lives. Indeed, it was reported that approximately 100 million people across the archipelago continue to live on $2 or less per day. Particular successes of Australian ODA in Indonesia can be seen in the improvement of almost half a million people’s access to clean water and sanitation and empowering over 17,000 women by helping establish 950 local women’s groups. Despite this impressive track record, the challenge for Australia is to ensure that Canberra strikes the right balance between cost-cutting amidst domestic pressures for austerity and funding quality grassroots projects in countries like Indonesia. These projects are lifting living conditions while simultaneously building locals’ trust in the Australian country and people. This is timely given Australia’s recent May budget, which revealed Australia’s foreign aid spending is at a record low. Both governments are also increasingly facilitating rich people-to-people exchanges in both countries. Indonesia remains as popular as ever as a tourist destination, assisted by the recent removal of visa fees for Australian visitors, as well as the introduction of more direct flights to Indonesia than ever before. Australian education also remains popular with Indonesian students seeking to study abroad, something which Canberra has capitalized on with the award of 866 Australia Award scholarships to Indonesian students in 2015. As foreshadowed earlier, this pipeline of Australian educated Indonesians will pay dividends in the future. Pop-culture must not be underestimated as a unifying force either. Indeed, Australians recently fell in love with Tasia Seger and Gracia Seger—the loveable and loquacious Indonesian-Australian sister cooks who graced Australian television screens as part of the 2016 My Kitchen Rules cooking competition, which they went on to win. While seemingly immaterial, Australians’ increasing exposure to Indonesian people and culture, at the grassroots level, works to transform attitudes of Indonesia beyond boats, beef, and Bali. Greater understanding of the other must occur at both people-to-people and government levels. Despite speculation of the doomed state of relations following Chan and Sukumaran’s executions last year, as former Indonesian President Yudhoyono recently claimed, the relationship has been “elevated and transformed.” This has largely been the result of wider concentration on the similarities and complementarities shared by both countries in the domains of politics and security, economics and trade, as well as the facilitation of increasingly rich people-to-people links between the peoples of both countries. Jarrad Harvey is currently a postgraduate student in the Department of Government & International Relations and Department of Indonesian Studies at the University of Sydney. The views expressed here are his own. Public outrage at the execution of the Bali Nine ringleaders runs into political, diplomatic and economic reality.